Many pupils have been spotted reading horror novels. Why don’t you try reading The Graveyard Book by Neil Gaiman? 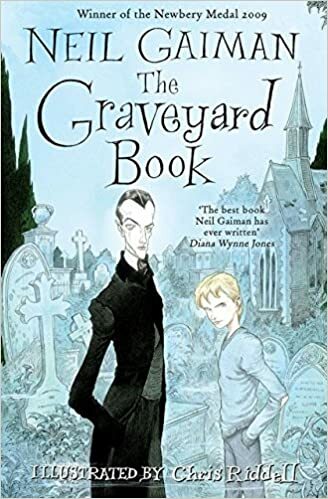 Did you know that Neil Gaiman’s The Graveyard Book (2008) about a baby boy who is found and brought up by the dead in a cemetery was inspired by The Jungle Book? However, Gaiman added a dark twist to his story. On the night Jack murders a family in their beds, their toddler runs out into the night, pursued by the murderer, and finds his way into a cemetery. The ghosts there chase away the murderer and, after much argument, decide to raise the boy. They name him Nobody, Bod for short. As long as Bod stays in the cemetery they can protect him from Jack, who is still searching for him. But a growing boy, even one who is granted the Freedom of the Graveyard, eventually needs contact with the living world — and it is the world of the living that holds the most danger for Bod. Here’s an official book trailer and a reading of the first chapter by author, Neil Gaiman, himself!